With DellT CompellentT, enterprise data is actively, intelligently managed throughout its lifecycle so you can constantly adapt to changing business conditions. Together, a Fluid DataT architecture, storage virtualization, intelligent software and modular hardware bring unprecedented efficiency, simplicity and security to enterprise storage. Data center resources are utilized to their full potential. Built-in intelligence and automation ensure data is available when and where it's needed. And an open, persistent hardware platform scales in line with business needs to protect storage investments over the long term. 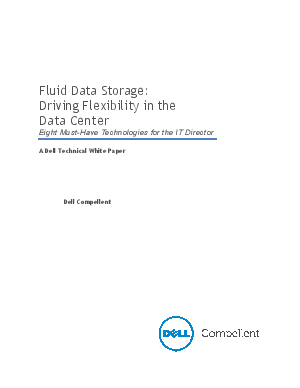 Fluid Data Architecture - Storage is managed at the most granular level with built-in system intelligence to enable the dynamic flow of enterprise data. Storage Virtualization - Storage is virtualized at the disk level to create a flexible pool of storage resources shared by all servers all the time. Thin Provisioning - Allocation is completely separated from utilization so any size volume can be created at any time, yet capacity is only consumed when data is written. Automated Tiered Storage - Data dynamically cascades from tier to tier according to actual usage, freeing up high-performance drives for mission-critical applications. Space-efficient Snapshots - Continuous snapshots only capture changes in data for real-time protection with instant recovery to any point in time. Thin Replication - Data is replicated between local and remote sites using space-efficient snapshots and native IP connectivity, eliminating the need for high-speed data links or identical system configurations. Unified Storage Resource Management - All storage resources are managed through a single, point-and-click interface providing a complete view of the entire storage environment. Open, Agile Hardware Platform - Storage is designed for persistence, not obsolescence, leveraging a single, modular hardware platform coupled with technology independence.